I've won my first award! This is so timely because I've been getting ready for the MOTYs (the annual and fictional prestigious Mama of the Year Awards). 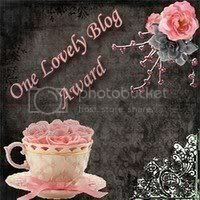 I know it was a bit presumptuous to have writen my acceptance speech already but with a few tweaks I can use it for my One Lovely Blog Award. I'd like to thank my husband, Scott, without whom I'd be single. I'd like to thank my parents without whom I'd not be alive. I'd like to thank Denise, at There's Always Room For One More, without whom I'd not have this award. And I'd like to thank all the little people. Well, especially two little people, Jack and Logan, without whom I'd have nothing to write about. 1. A Family is Forever written by Kristin: Kristen's blog is about her busy life as a mom to two teenagers and two younger kiddos. I almost feel bad passing this award to her as she just recently had to pass on another award. But I like her blog so much that I could justify making more work for her. 2. Top Notch Swill crafted by Lisa (and various guest writers): Lisa and her friends know how to craft a well-written post. Always honest and often humorous, their blog is a great read. Lisa has another blog, A Motherlode, in which she uses her writing talent to talk about daily life with her husband and their 4 children. 3. He & Me + 3 by Mimi: Not only do I enjoy reading her Friday jokes and about her three kids but if there were an award to bloggers who give the most comment love, she'd be a shue in. I always enjoy hearing from Mimi whether its in my comment box or on her blog. 4. There is Always Room for One More penned by Denise: Well, I don't really expect Denise to pass this award on yet again since she is the one who so graciously passed it to me just the other day. But her blog (AKA my favorite) about her 6 (yes, really 6!) kids is the epitome of this award. If she hadn't given it to me, I'd be giving it to her. She also has two other blogs, both very heartfelt and poignant; one about the adoption of her daughter from Vietnam at the time that the US Government was ceasing adoptions from that country and one about her husband and his death. Whew! This award business sure is exhausting! Good night all and thank you! Thank you! Thanks for thinking of me!! Can I gift it back to you....because I love reading you too!! You are so kind...I gladly accept this award and congrats to you too! Carey...you make me giggle...and blush! Thank you, sweet girl, for this AWESOME award! I am honored and humbled and THANKFUL. :) You always leave me such fun and wonderful comments and I enjoy your writing so much every time I visit here....you've got to write something for the Swill site, girl! And I'm with Kristin...can we gift it back to you? Because then you can give ANOTHER witty acceptance speech. :) Thanks, Carey!!!! Ah **blushing** Thank you, thank you. Your speech was perfect! I loved it!!! See? That's exactly why you got this award! Congrats on your award!! Love your blog! !